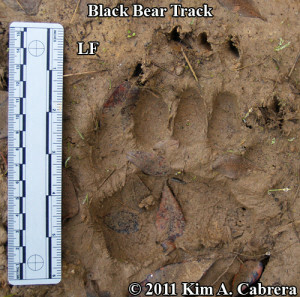 An estimated 30,000 (and increasing) black bears (Ursus americanus) occupy a variety of habitats in California. Previous to our work, population units and dynamics were unknown on a state-wide level. In an analysis of DNA of 540 black bears across California, our lab and collaborators discovered distinct population structure and genetic evidence of 2 historic colonization events (Brown et al 2009). First, DNA types (genotypes) of bears sampled in southern California are most related to those from the Yosemite National Park region and not with spatially intervening populations. Historical records recount the translocation of 28 black bears from the Yosemite National Park area of the central Sierra Nevada to the San Bernardino Mountains in southern California in the 1930s. The genetic data confirmed that bears living today carry that Yosemite translocation genetic signature. Second, before colonization of California by Europeans, the Central Coast region was inhabited by the now extinct California grizzly bear (Ursus arctos californiensis), but not many black bears. Following an apparent competitive release and range expansion during the past century, black bears now increasingly inhabit the Central Coast. These Central Coast Black bears display lower genetic diversity (founder effect) and a genetic signature most closely allied with black bears from the southern Sierra Nevada. In both these cases, molecular genetic techniques allowed historical reconstruction of anthropogenic events leading to changes in animal distributions. Jamie Sherman for her PhD, in our UC Davis lab, has generated detailed new genetic data for the Central Coast to help wildlife and land managers better understand bear population dynamics. Working with California Department of Fish and Wildlife, Jamie used molecular mark-recapture (DNA from hair) to estimate numbers of black bears. When a bear left its hair a second time near a sampling site, Jamie detected that bear multiple times via the DNA trace it left (therefore the “mark-recapture” name of the technique) … tracking bears non-invasively through hair they leave behind. PhD student Jamie Sherman has developed a new diagnostic test to determine the presence of a parasite dangerous to people, called Trichinella (the reason wildlife meat and pork should be well-cooked, so humans don’t contract it). Stay tuned for more soon! Brown SK, Hull JM, Updike D, Fain S, Ernest HB. 2009. Black Bear Population Genetics in California: Signatures of Population Structure, Competitive Release and Historical Translocation. Journal of Mammalogy. 90:1066–1074. 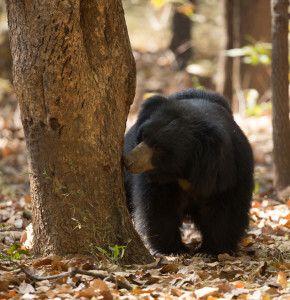 Information from this research is having on the ground positive impacts to aid how black bears are managed and conserved. We collaborated with California Department of Fish and Game, US Fish and Wildlife Service Forensic Laboratory, United States Department of Agriculture-Wildlife Services, National Park Service (NPS) and independent researchers.